As agencies strive for success in digital government, they often need to open their virtual doors and meet the public in new and evolving spaces. Federal Student Aid meets its audience in the 21st century public square at monthly #AskFAFSA sessions. During the live Twitter chat, students, parents and the general public can submit questions about financial aid using the #AskFAFSA hashtag. The event is held on the last Wednesday of each month, and questions are answered from the @FAFSA Twitter account from 5 pm until 6 pm, EST. The event is organized by the Federal Student Aid Digital Engagement Team, and questions are answered by FAFSA subject-matter experts (SMEs). A transcript of every session is available the following day via the Storify platform, for those who are unable to attend or who don’t use Twitter. #AskFAFSA sessions have been held since January 2012. Each month’s chat focuses on a specific theme, in order to drum up interest and target specific populations. However, participants are welcome to ask any question about financial aid, regardless of the month’s theme. During December’s chat, the team answered 45 unique questions. 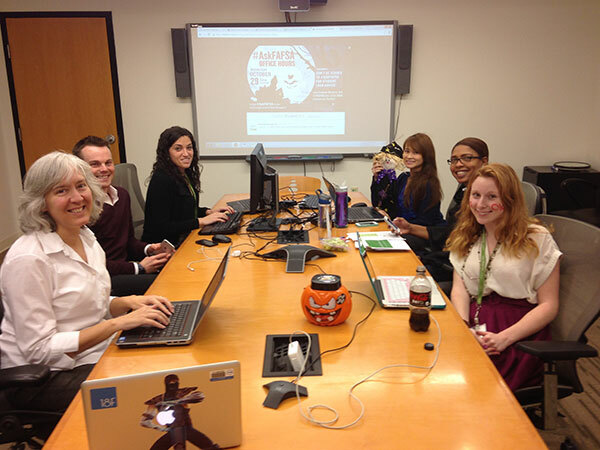 In November, SMEs from the Department of Veteran Affairs Benefits Administration participated in an #AskFAFSA session to respond to the most pressing questions from veterans. In March 2013, a bilingual chat was hosted in Spanish and English with support from New Futuro, an education company that supports Latino students. The Digital Engagement Team uses Google spreadsheets to track questions, assign roles, and document responses for each chat. There are typically five or six people involved in each chat, and the spreadsheet helps keep everyone organized, said Sandra Vuong, Digital Engagement Strategist for Federal Student Aid. She said that the spreadsheet also helps the team create their Storify stories. 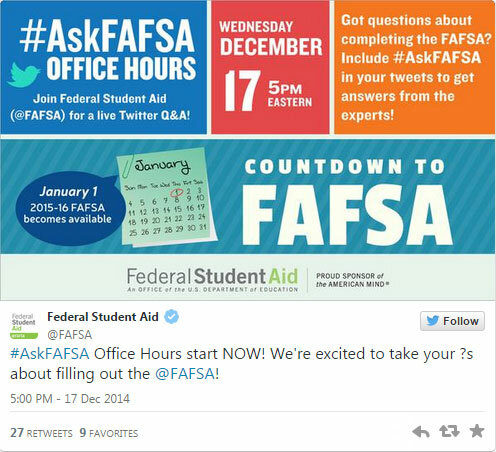 #AskFAFSA questions are accepted starting on the Monday before each chat. This allows the staff to kickstart the conversation when the live chat begins. 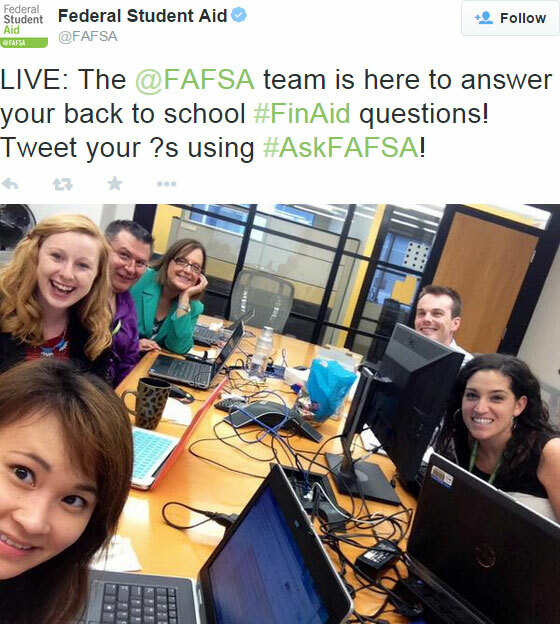 The Digital Engagement Team also looks at Twitter for back-up questions: Questions people are asking about student loans but are not directing to the @FAFSA account. Vuong shared tips for finding back-up questions from keyword searches. The Digital Engagement Team organizes chats by assigning each person a role. The router monitors the Twitter stream for hashtags and direct tweets and adds relevant questions into the shared document. The SMEs develop answers. A content facilitator assigns questions, verifies that the answers are correct, and adds applicable links. Finally, a Tweeter pastes the answers into Twitter and checks to make sure links are working properly. Vuong said that having two Federal Student Aid SMEs at each event has proven useful for ensuring high-quality chats. Including outside SME guests also helps to increase the visibility and utility of the sessions. Vuong pointed to a session from October 2013, which included two loan servicers that manage government student loans. Although the loan companies have their own Twitter handles, Vuong said the Federal Student Aid team wanted the public to know that they can ask questions from the companies and from Federal Student Aid. One of the challenges of #AskFAFSA is the time investment, Vuong said. Because #AskFAFSA is a monthly event, it can add extra pressure to busy times of the year. Staff limitations are another constraint. The four-person Digital Engagement Team does not have a metrics specialist, so each person works on a piece of analytics. Regardless of the challenges, Vuong said, the effort is worth it.